Mashable. February4, 2013. (English) by Camile Bautista. -In the battle between elementary school students and pro football players, second graders reign supreme. When it comes to grammar, that is. 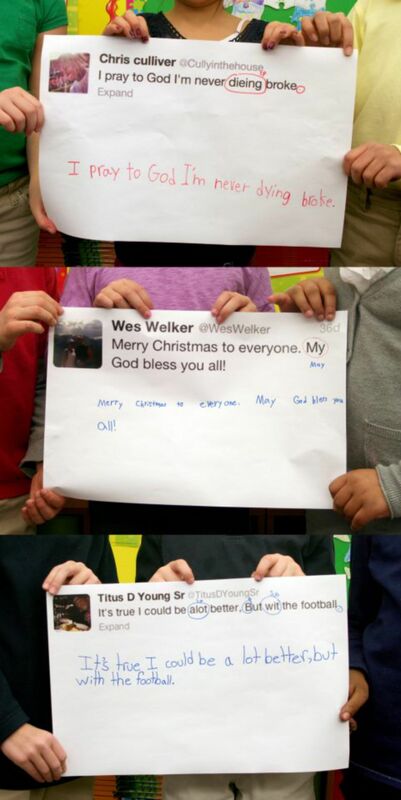 Second graders at a New York school had some help from Twitter for their grammar lessons, using the tweets of NFL players to correct spelling, punctuation and sentence structure. While working in groups, the students “found several mistakes in these tweets, including the incorrect spelling of ‘a lot,'” explains a post on Elmwood Franklin School’s Facebook page. The students corrected one gem from 49ers’ Chris Culliver who posted, “I pray to God I’m never dieing broke” (tweet has since been deleted), along with other statuses from Patriots’ Wes Welker and Lions’ Titus Young. Merry Christmas to everyone. My God bless you all! Check out the kids’ corrections, below. Though Twitter isn’t exactly the most PG of places for kids, they took to the printed tweets with red pens in hand, circling errors and rewriting sentences. Dare we ask for next year’s halftime show to include a spelling bee face off?